This would make a lovely luncheon salad or light dinner. We served it as a starchy side instead of potato or rice. Inspired by a recipe from Katie Quinn Davies. Arrange arugula on a serving platter. Slice sweet potato as you would yams, and arrange on arugula. Thinly slice chorizo and brown in a nonstick skillet a few minutes to render out excess fat; drain on a paper towel. 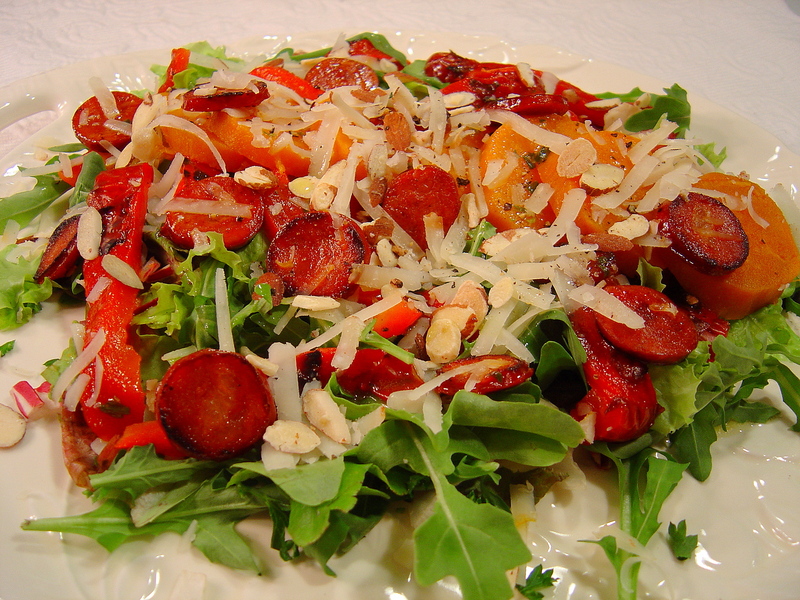 Sprinkle salad with peppers, chorizo, cheese, and almonds. Whisk together oil, lemon juice, basil paste together and season with salt and pepper.